The Twister Sit & Go’s at the iPoker network are similar to all other 3 man Turbo Sit & Go tournaments on the market- a winner-take-all format with an innovative structure. The prizes are determined by chance at the beginning of each tournament. 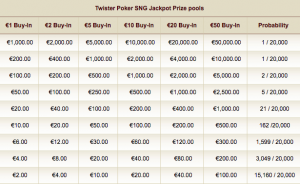 The buy in of each player is multiplied up to 1000 times by the iPoker random number generator. A buy in of just €1 can earn up to €1,000 in just a few minutes. 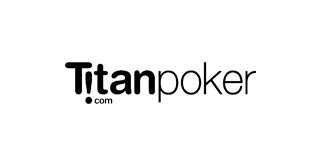 The tournaments enjoy great popularity with all iPoker players. The incredibly high number of casual players, make this Spin & Go variant suitable for players who play poker professionally and want to earn real money, and for casual players as the talent pool is often low. We love this variant- games go fast, the profits are large, and the pool of players is full of fishes. The traffic is clearly strongest on the iPoker network compared t0 the Spin & Go variants offered at the other poker rooms. Starting from the low stakes up to the high limits, there are always full tables and decent traffic. You only have to wait a maximum of a few seconds before the action starts. If you are looking for 24/7 traffic on a wide range of limits, this is the place for you. 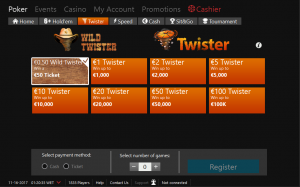 Can I make money with the iPoker Twister Tournaments? Again, a clear yes! The rake is only 7% on all buy-ins and the high rakeback makes it all the more profitable. Even without the benefit of a high multiplier, the winnings are good. If you claim the YourPokerDream VIP rakeback deal, the Twister SNGs are a fantastic choice for grinders who are looking to earn money. The high prices and the thrill attract a lot of fish, which makes the tables incredibly profitable. How much Rakeback can I get through the YourPokerDream VIP Deal? 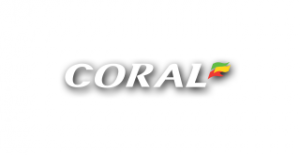 For highest Rakeback, we recommend our Coral Poker Rakeback Deal. This deal is perfect for iPoker Twister tournaments, and is exclusive to YourPokerDream players. It’s the highest deal on the net. What do I have to do to get the YourPokerDream Rakeback Deal? Log into your YourPokerDream account and enter the username next to the poker roomy just registered at. Everything else is automatic. We check your registration with the poker room and then add the VIP deal automatically. This usually takes 12-24h.